I revisited a museum I had not seen before, in a phantom-like way. As assistant curator Ryan Inouye steps out of the elevator onto the fifth floor of the New Museum, we connect through Skype. Looking at my screen through the camera of Inouye’s iPad, I’m peeping through a transparent photographic reproduction showing the view from CHR’s west window in Johannesburg, into the museum’s study room and out of their windows onto the west side of the Bowery. A timeline above the museum’s windows lists major events connected to the famous street. Now long “past the point of gentrification”, according to Inouye, for artists the Bowery once was what Doornfontein in Johannesburg is now: a downtown neighbourhood with affordable rents. This doubling view and the subtle critique that it provokes remind me of seeing a screening of a restored version of Lionel Rogosin’s scripted documentary “On the Bowery” (US, 1956) on location in the Bowery Mission, below the New Museum, which is still surviving in the midst of “re-development” and was once an indispensable refuge for the lost souls of skid row. Inouye turns his iPad away from the windows inwards into the small gallery space where I see a small but varied exhibition consisting of video and film works, textual afterthoughts to performances, school desks shipped from Johannesburg (supporting either video works on tablets or papers), a wall painting, and closing off a small corridor around the corner is a large-scale photo collage. 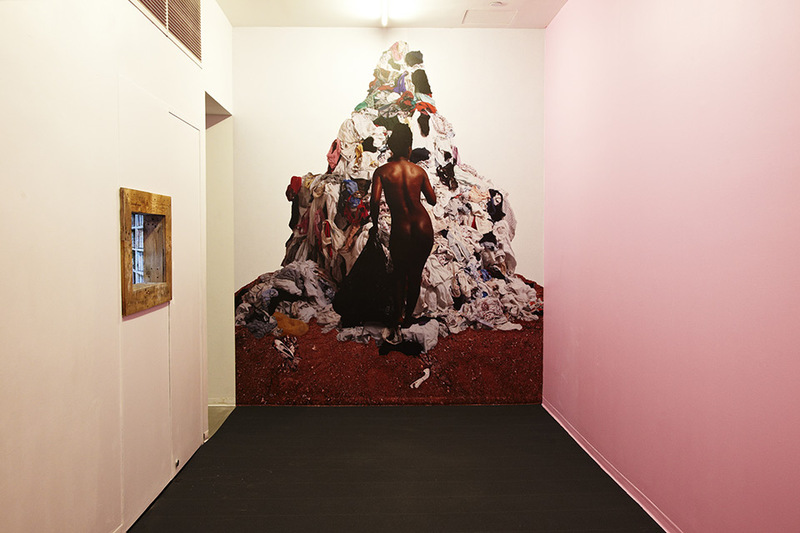 Zanele Muholi’s ‘Tzidwedwe as Part of Insila Yomuntu (after Pistoletto)” (2010) was commissioned by CHR in the early stage of their formation in 2010 and displays the collective’s philosophy in a nutshell, where we find the notion of recycling and re-chewing already manifest. The little tour starting with a virtual view of Manhattan via Johannesburg ends with a new view of a canonical posture from the Greek foundations of Western aesthetics through an African restaging of it. Both double windows merge fluidly. Critical questions—whether or not in a post-colonial vein—are what we ourselves have to come up with. The prefix “re-” is implicit and sometimes explicit in CHR’s works, or works by others they chose to include. 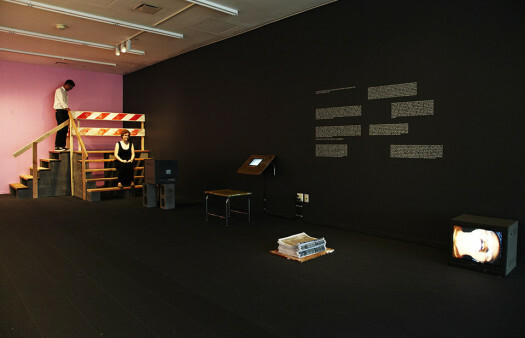 We should not confuse the recurring “re-” with a sort of nostalgia for better times past, but rather as the improvised style of intercultural translation as witty interpretation, as examined in the documentary “Veejays: The Movie” (Andres Carvajal & Sandra Gross, 2010), part of the New York show. Re-chewing as an updated version of the “cultural cannibalism” from Oswald de Andrade’s 1928 Manifesto Antropófago: rumination on cultural expressions from former colonial powers, so as to produce recycled art—both a critique and creative digestion. The exotic and the endemic intermingled and indistinguishable. Kemang Wa Lehulere considers the lecture-performance he held within the exhibition space to have been a rehearsal for a future video essay in which notions of “rehearsal for suicide” (acts of falling—real and metaphorical), repetition and re-enacting will be examined through a range of films, poems, and literary and philosophical texts and comments. In Lehulere’s opinion, re-enactment constitutes a sort of “embodying of imagination”. Thus we can perceive the staging (or rehearsing) of CHR’s suicide as a way out of the post-modernist trap of re-chewing without ever (re-)producing anything important. The concept of the after-after tears and the partial revisiting of earlier works results in a retrospective being prospective to an equal extent. In a wall-mounted text, part of “After-after Tears”, related to a study on the first Zulu-intellectual Magema Fuze, I read: “How does someone reconcile these things: the divine metaphysical forces and the more political everyday kind of manoeuvrings?” Fuze was a “cultural translator”, bridging Zuluness and European modernity. Although put in the context of the transition from indigenous to post-indigenous identity, it is an important question for artists from a country that has been, and to a large degree still is, divided to the extreme. Moreover, it is an invaluable question to any artist whose work engages and re-engages with history and the politics of history. To present is to re-present. “The theory of reminiscence”, writes philosopher Clément Rosset in The Real and its Double (2012 ), “… teaches that there can never be any genuinely primary experience in this world. Nothing is ever discovered: everything is regained and comes back into memory through being reunited with the original idea.” Is the “re-” a precondition for making digestible the primary rawness of reality? 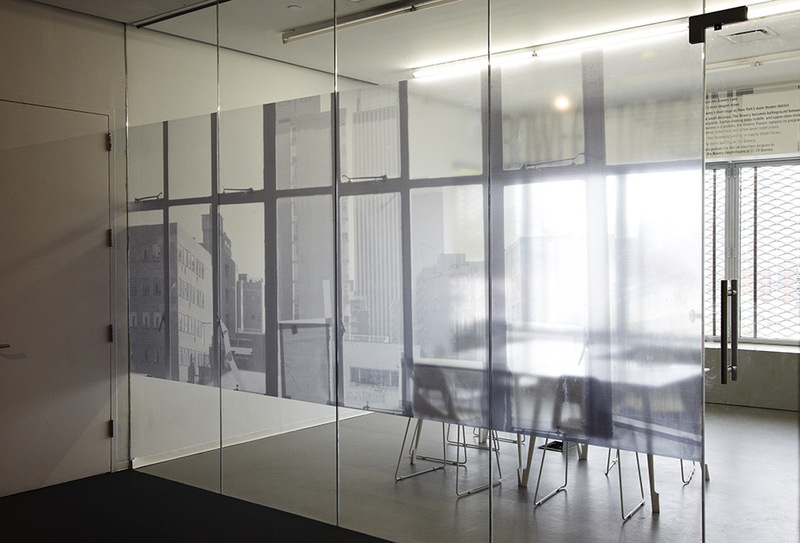 Does reality only present itself through frames and windows? CHR acts as a “third” in between the seeming opposites as noted above, the museum (the institution-institution) as a “fourth”, the channelling functioning of modern communication media as a “fifth”—and where stands the reviewer? Is he a “sixth” intermediary, or in between all the others? Most certainly he is late to the party—coming after to not even an after-party—and those reading the review who, like the reviewer, didn’t see the exhibition in reality are coming after-after-after. Feedback-loops of recycling, revisits, re-imaginings, rehearsals, repetition, and so on. By virtue of their “re-“approach, CHR offers a temporary way out of tragedies of the real: out of the art of history and history of the arts—making you aware of processes of cultural translation—then leading you back into art again. There should be no end to the intelligent and creative re-questioning of what has been enacted before. Thanks to Ryan Inouye of New Museum for giving me a Skype tour through the exhibition; to Kemang Wa Lehulere for a live interview in Amsterdam; and to Gabi Ngcobo in Johannesburg for a Skype interview. *This exhibition review appeared in print in Camera Austria International 123 (Autumn 2013), pp. 79-80.